My daughter works for a restaurant group in downtown Raleigh. 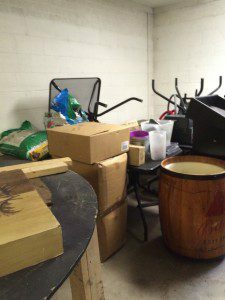 The group had a storage unit full of everything from restaurant equipment, to old files, glassware, and more. 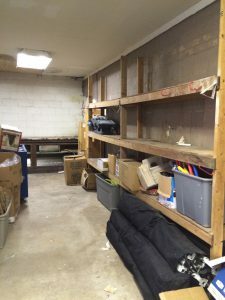 When she mentioned the company was clearing out the storage unit, I knew I wanted to dig in and help out! 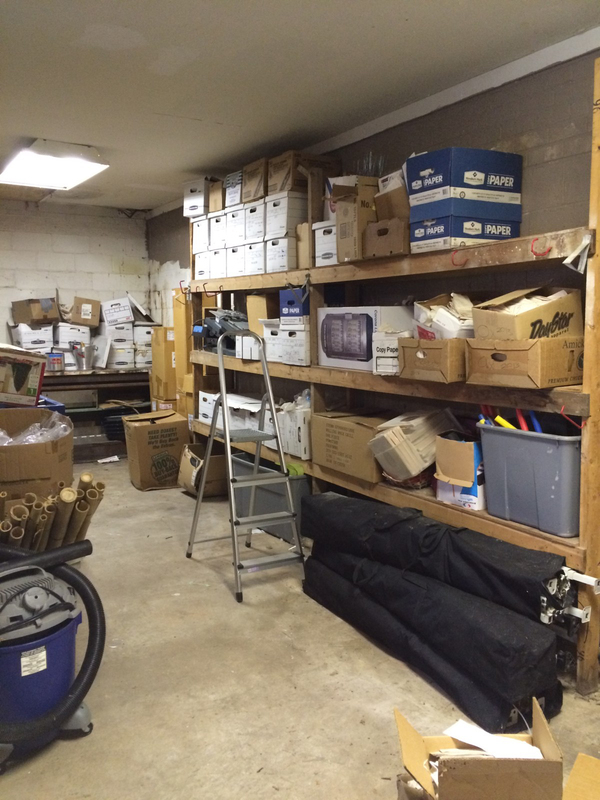 First, we met and did an initial sort and purge. We created a pile of items we knew were trash towards the front of the unit. Then, we marked the larger items along the perimeter we knew we wanted to give away. This job would not have been such a breeze without the help of two pivotal partners… read on! 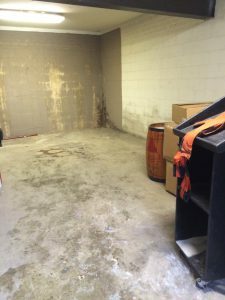 This is the entrance to the storage unit and where we started piling up stuff that needed to go. Random stuff to go and a few keepers. This photo shows all the old records that we gave to ProShred to shred. You can see the mountains of trash we created near the front door, the papers filling the shelves, and the furniture lining the perimeter. 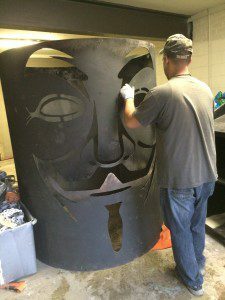 This metal scripture was used for the Guy Fawkes event at The Oxford restaurant, sad to see it go. 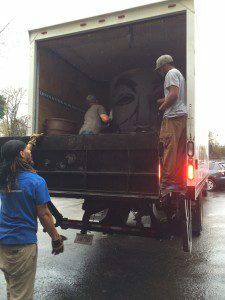 Bye-Bye Guy Fawkes, we’ll miss you. It was a challenge for the guys to load this one! Stuff for Garage Brothers can recycle. They recycle everything! I called on one of my favorite partners – Garage Brothers! Kraig Bantle is the owner of Garage Brothers and I met him several years ago at an event and also read about him in the papers. 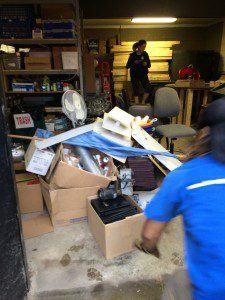 What I really like about his concept is that it’s possible to clean out your garage for free as long as there is something there of value for Kraig to either resell or sell to a recycling company. He is easy to work with and his crew is fast and efficient. My daughter loved the company’s dedication to bettering our environment. 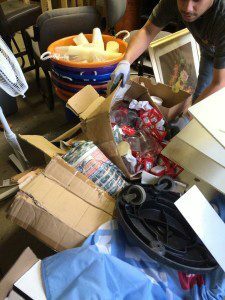 Garage Brothers finds new homes for their client’s unwanted items through sales, recycling, or donations to various charities. They do whatever possible to ensure that as little as possible is added to our landfills. This is the entrance-piles gone!! 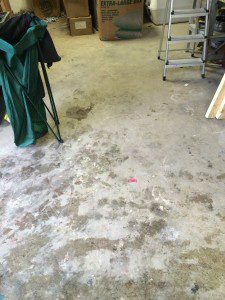 Clean floors, empty corners, and bare shelves. Success! Those shelves didnt get empty on their own. I used another one of my trusted partners to shred the old paperwork in the storage unit – ProShred. What is wonderful about ProShred is that they show up to your location (no need to pack it in your car and haul it to their facility). They do all the heavy lifting and it’s shred right there on your premises. They can even shred hard drives and computer media in addition to your confidential documents and electronic media. They also have a residential drop off service.